As citizens of Kingston are aware, last fall a proposed shooting range project came up on the radar for Midtown. Initially, the City of Kingston’s Planning Board, perhaps wishing to avoid a contentious and emotional public comment period on 2nd amendment rights, declined to host a public hearing on the subject. A small group of citizens, however, respectfully pressed for one and ultimately, the planning board obliged. In December of 2015, the first public hearing was scheduled and many good points were raised. VIEW public comment from December’s public hearing on the proposed shooting range. There are other concerns for our Planning board to contemplate on Monday. Regardless, the purpose of zoning is to uphold “the protection and promotion of the public health, safety and welfare” of a community. Decisions of a Planning and Zoning board are not based on opinion. 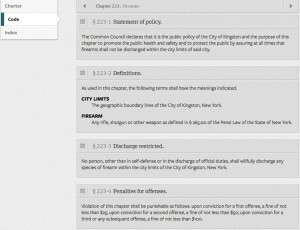 Their role is to uphold the law and the law clearly states that discharging a firearm is illegal in the City of Kingston except under very specific circumstances.